Healthy Taco Salad – this delicious and hearty Mexican recipe has all the flavors of a classic taco. Made healthier with ground turkey, lettuce, cabbage, black beans, cherry tomatoes and an avocado lime dressing. Plus options for low carb and keto taco salad. Raise your hand if you love tacos ?but not the calories? This Healthy Taco Salad is here to curb those taco cravings. It’s got all the delicious flavors and toppings you love about tacos in a giant salad form. I am a HUGE fan of loaded salads once the weather starts to warm up. They are perfect for those hot spring and summer days when you’re craving lighter food. The best part is, they come together quickly and are super simple to customize. 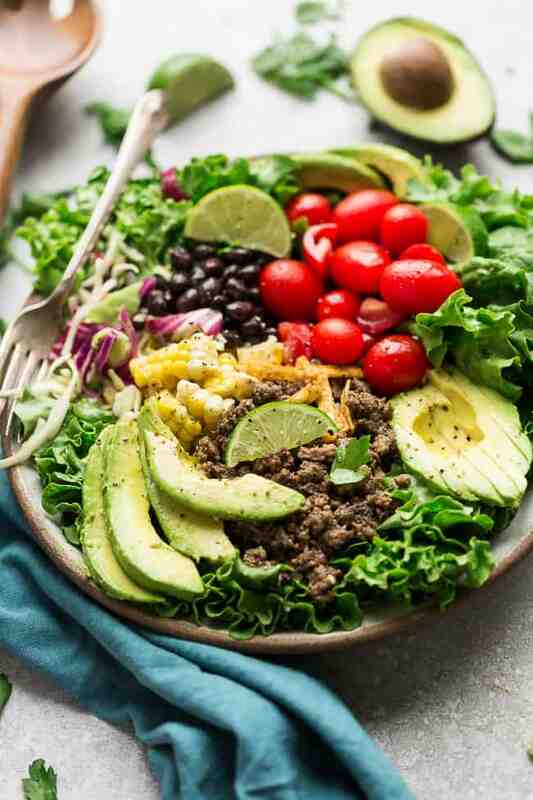 And with Cinco de Mayo just around the corner, this Healthy Taco Salad would fit in perfectly if you’re trying to include some lighter options for your own Mexican fiesta. 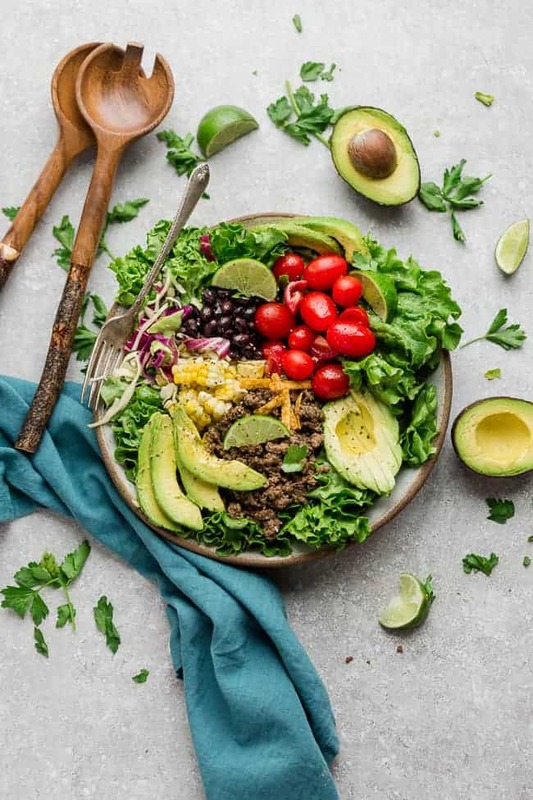 Not only do you have little bit of spicy, sour, creamy and savory in every bite…this skinny taco salad is also loaded with nutrition! You’re going to start off by browning your meat with some taco seasoning. The great thing about this recipe is that you can use the homemade recipe below or swap in your favorite brand of taco seasoning. Wash and prep your veggies and layer them into bowls. We used green leaf and butter lettuce, corn, grape tomatoes, shredded cabbage (red and green) and black beans. See below for low carb options. 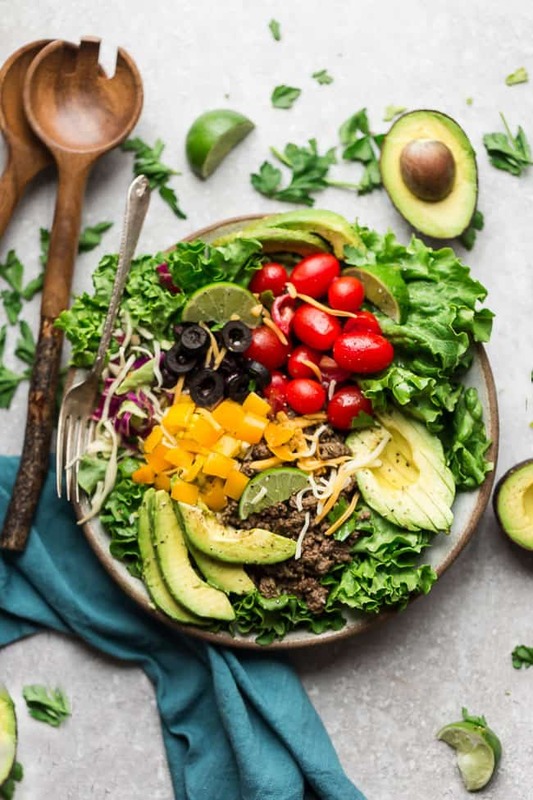 To make the avocado lime dressing – toss the avocado, lime juice, cilantro, salt and pepper into a food processor (or blender) and blend until smooth. Optional toppings – sprinkle with a little bit of cheese (or leave out for dairy free option) and tortilla chips for a restaurant copy-cat version. CAN I USE DIFFERENT MEAT AND VEGETABLES? Swap out the tomatoes for salsa or a dollop of guacamole. ARE THESE TACO BOWLS LOW CARB AND KETO-FRIENDLY? 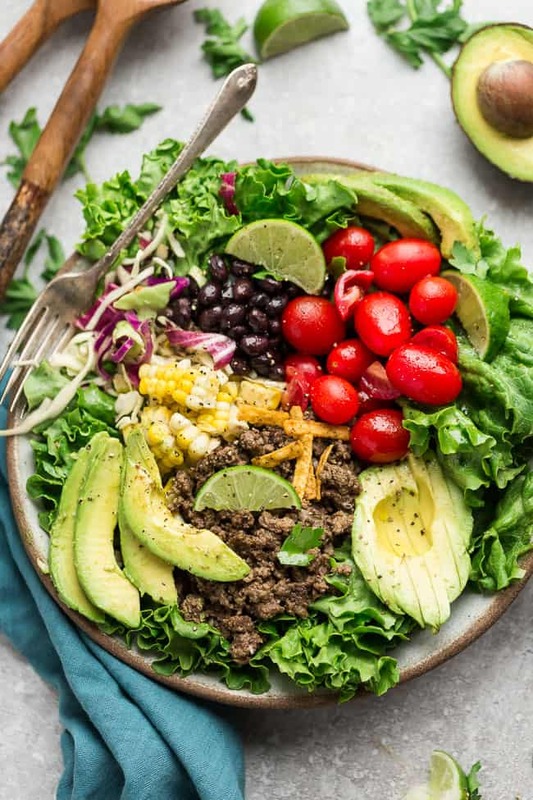 For a low carb and keto-friendly healthy taco salad, leave out the corn and black beans and swap in some olives and yellow bell peppers instead. 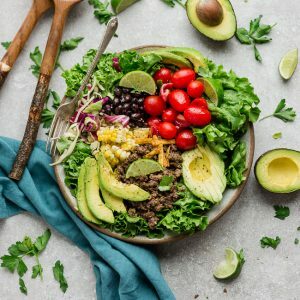 CAN I MAKE THIS HEALTHY TACO SALAD AHEAD OF TIME? Absolutely. One of the things that helps meget in and out of the kitchen quickly is to keep my fridge stocked with lots of fresh seasonal vegetables. Cook the meat ahead of time and store in an air-tight container. This easy Mexican recipe is made healthier with ground turkey and an avocado lime dressing. Includes options for low carb and keto taco salad. While the meat is cooking, add the avocado, cilantro, lime, orange juice, olive oil, and salt to a food processor. Process until smooth. Add lettuce to a large bowl. Top with cooked turkey, cherry tomatoes, corn, black beans and shredded cabbage. Add the dressing and toss to combine. Serve immediately avocado, lime and additional taco toppings as desired. Do you have a keto friendly substitute suggestion for the orange juice in the salad dressing? Hi Colleen, you can just leave the orange juice out and add a little bit of your preferred low carb sweetener (erythritol, swerve or monk fruit) if you want to offset some of the sour 🙂 Hope that helps! This looks fabulous, and i’m going to make it this weekend. For keto, you can sub black soybeans, and make some homemade egg white tortillas.